Buying a table tennis racket can be a daunting task. With such a bewildering array of choices and prices, it's easy to buy the wrong one and then discover that you've made an expensive mistake. So how do you know which one you should buy, and which ones you should avoid? How can you ensure that you make the right choice? 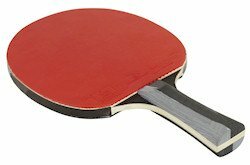 What's the real secret to choosing a table tennis racket? Well, in this E-book you'll discover the fascinating insider information that'll help you choose the perfect racket for you. What's Included in this E-book? What's a resource like this worth? 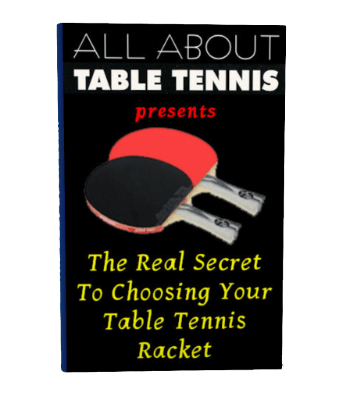 The information in this E-book will save you a small fortune by helping you to choose the right table tennis racket for YOU. When you consider that a single sheet of table tennis rubber will cost you about £50 (approx $70), you can easily make an expensive mistake. Which is why "The Real Secret to Choosing Your Table Tennis Racket" is such a bargain at only £9.99 (approx $13). So why am I making it so affordable for you? Well, simply because this is a downloadable E-book that can be downloaded to your computer right now. That means that there's no postage costs to pay, and you can be reading it in less than 5 minutes from now. No matter what, it's a real bargain for you. But maybe you're still thinking ... But Will It Really Help Me? Even though the information in my E-book is worth MUCH, MUCH more than the amount it will cost you today, you may still be wondering if it will help YOU. Well, I'm so confident that this E-book will help you that I'm also giving you a no quibble 60 Day Money Back Guarantee. Grab a copy of my E-book today and if you don't learn something new and useful, I'll give you your money back. So there really is no reason for you to delay any further. This is an 25 page downloadable E-book - It's not available as a traditional printed book. What is a downloadable E-book and why is it better than a traditional printed book? And it's only available right here on my web site, so you won't see it anywhere else. You'll need Adobe Acrobat Reader installed on your computer to view my downloadable E-book. Most computers have it installed already - it's FREE, but if you're one of the few who don't already have it installed, click on this link http://get.adobe.com/reader and follow the instructions on their web site to download it. What happens after you click the Buy Now button below? You'll be taken to a secure order form where you'll need to enter your details and then you'll go on to pay by credit or debit card (or use your paypal account). When you've made your payment you'll receive the download link and password to enable you to download your E-book immediately. It's really easy, but if anything does go wrong, or if you have any problems, just contact me. If you want to avoid costly mistakes and get the racket that's perfect for YOU, then you need to get your hands on this E-book right now. It's not available as a traditional printed book. When you have completed your payment, you'll immediately be directed to a link where you can download your E-book. There's no waiting time to get your E-book!